Arrow Video USA recently send us information that Abel Ferrara's "The Driller Killer" will be hitting Blu-Ray. The film is one of the most infamous video nasties ever made and will be available in regular and limited edition steelbook. Special features on the blu-ray includes Audio commentary by director and star Abel Ferrara, moderated by Brad Stevens (author of Abel Ferrara: The Moral Vision) and recorded exclusively for this release, Brand new interview with Ferrara, Willing and Abel: Ferraraology 101, a new visual essay guide to the films and career of Ferrara by Alexandra Heller-Nicholas, author of Cultographies: Ms. 45, Mulberry St. (2010), Ferrara's feature-length documentary portrait of the New York location that has played a key role in his life and work, available on home video in the UK for the first time ever, Trailer and Collector's booklet featuring new writing by Michael Pattison and Brad Stevens. "The Driller Killer" hits retail on November 29th. In career that has encompassed such controversial classics as Ms. 45, Bad Lieutenant and Welcome to New York, none of Abel Ferrara's films have quite managed to match the shock, extremity and downright notorious nature of The Driller Killer. 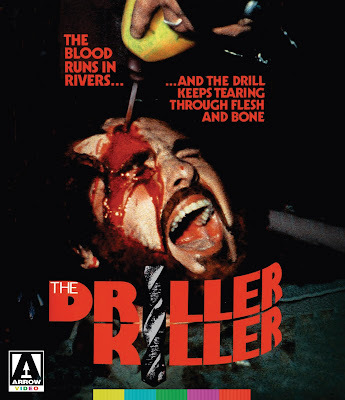 One of the most infamous 'video nasties', in part thanks to its drill-in-head sleeve, The Driller Killer has lost none of its power to unnerve and is presented here fully uncut.